WASHINGTON, D.C. – The National Society Daughters of the American Revolution (DAR) announced today that the organization will be donating $3,000 to the Saluda County Historical Society for the Marsh-Johnson House Interior Restoration Project. 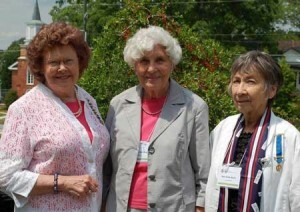 Funding for this project was made possible through the sponsorship of the Old 96 District Chapter, National Society Daughters of the American Revolution, located in Edgefield, S.C. This grant from the Old 96 District Chapter, National Society Daughters of the American Revolution, will help the Saluda County Historical Society in saving one of the oldest homes in Saluda County. During the 200 years plus, the land on which the Marsh-Johnson House sits was first the Ninety-Six District, then Edgefield District and Edgefield County and, since 1895, Saluda County. The Marsh-Johnson House is an early two-story, upcountry, plantation plain farm house built with simple lines and exceptional workmanship around the beginning of the American Revolution. The inside restoration will include replacing flooring, replacing a sill, if necessary, installing old-growth Saluda County pine boards on the ceiling and three inside walls of the two shed rooms, restoring doors, cleaning the walls and ceilings and painting the walls in historically accurate colors. The home can then be safe for visitors and become a house museum. The DAR grants program was started in 2010. Funding is awarded to support projects in local communities that promote the organization’s mission areas of historic preservation, education and patriotism. The DAR receives hundreds of grants applications each year, making competition for the funding through the non-profit organization high. Interested groups must be sponsored by a local DAR chapter, submit a copy of their 501(c)(3) IRS documentation, and include a narrative that describes the need and urgency of the project as well as planned activities and benefits to the community that will result from the grant. The National Society Daughters of the American Revolution was founded in 1890 to promote patriotism, preserve American history, and support better education for our nation’s children. Its members are descended from the patriots who won American independence during the Revolutionary War. With nearly 170,000 members in approximately 3,000 chapters worldwide, DAR is one of the world’s largest and most active service organizations. To learn more about the work of today’s DAR, visit www.DAR.org. For more about applying for a Special Projects Grant from DAR, visit www.dar.org/grants. For more information, please contact Meade Hendrix, Executive Director, Saluda County Historical Society, (864) 445-8550 or visit www.saludacountyhistoricalsociety.org.